There are two broad mechanisms by which plant populations persist under recurrent fires: resprouting from surviving tissues, and seedling recruitment . Species that live in fire-prone ecosystems can have one of these mechanisms or both . In a recent review paper , we propose a model suggesting that changes in evolutionary pressures that modify adult (P) and juvenile (C) survival in postfire conditions (Fig. 1 below) determine the long-term success of each of the two regeneration mechanisms, and thus the postfire regeneration strategy: obligate resprouters, facultative species and obligate seeders (Fig. 2). Specifically we propose the following three hypotheses: 1) resprouting appeared early in plant evolution as a response to disturbance, and fire was an important driver in many lineages; 2) postfire seeding evolved under conditions where fires were predictable within the life span of the dominant plants and created conditions unfavorable for resprouting; and 3) the intensification of conditions favoring juvenile survival (C) and adult mortality (P) drove the loss of resprouting ability with the consequence of obligate-seeding species becoming entirely dependent on fire to complete their life cycle, with one generation per fire interval (monopyric life cyle). This approach provides a framework for understanding temporal and spatial variation in resprouting and seeding under crown-fire regimes. It accounts for patterns of coexistence and environmental changes that contribute to the evolution of seeding from resprouting ancestors. 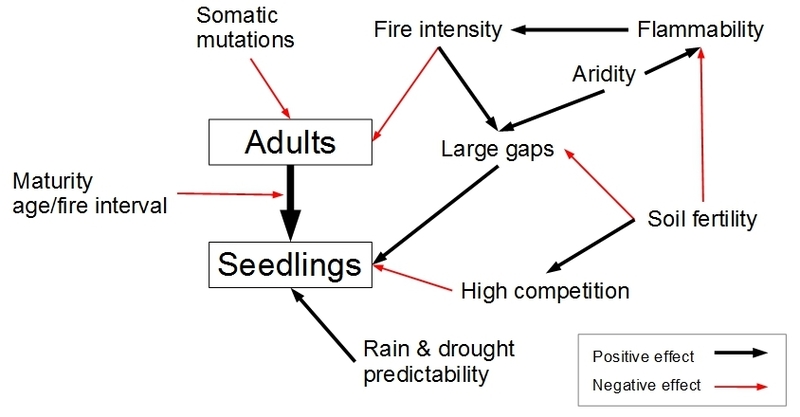 In this review, we also provide definitions and details of the main concepts used in evolutionary fire ecology: postfire regeneration traits, postfire strategies, life cycle in relation to fire, fire regimes (Box 1), costs of resprouting (Box 2), postfire seeding mechanisms (Box 3), and the possible evolutionary transitions (Box 4). Fig. 1 : Main factors affecting adult and offspring seedling survival (P and C, respectively), and thus the P/C ratio, in fire-prone ecosystems (from Pausas & Keeley 2014 ). Fig. 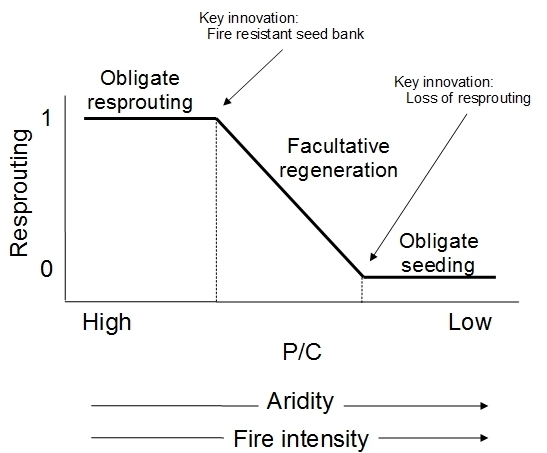 2: The changes in the probability of resprouting along an adult-to-offspring survival (P/C) gradient are not linear but show two turning points related to the acquisition of key innovations: the capacity to store a fire-resistant seed bank (postfire seeding), and the loss of resprouting capacity. Changes in P/C ratio may be produced by different drivers (Fig. 1) which drove the rise of innovations during evolution, e.g., during the increasing aridity from the Tertiary to the Quaternary (from Pausas & Keeley 2014 ).